Buy these Fragrances approved for use with your Rainbow or Rainmate targeted to people with asthma, allergies or breathing problems. The Rainbow Eucalyptus. This Rainbow fragrance can help you breath better if use it in a room with your RainMate or Rainbow. 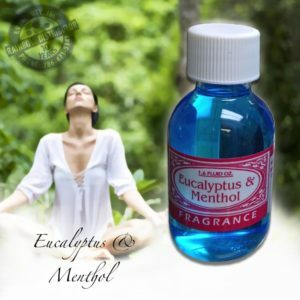 Eucalyptus with menthol small bottle. 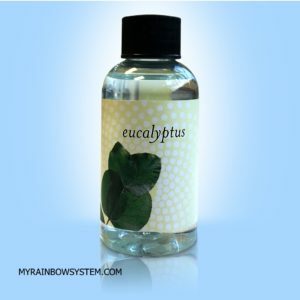 The special formulated Eucalyptus with menthol is a concentrated oil specifically designed to improve people breath, just add a couple of drops into your Rainmate or Rainbow water. Last longer. 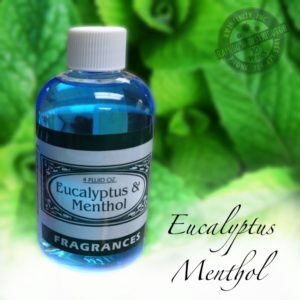 Eucalyptus with menthol in a bigger bottle. Same powerful effect of the small bottle but in a bigger presentation. More than double the size of the small bottle. Last about 1 or 2 months. The Rainbow is certified By the AAFA (asthma & allergy foundation of America), that means that it complies with certification standards which make the system friendly to people with breathing problems. Therefore every time they use the Rainbow, asthma or allergies attacks will reduce. 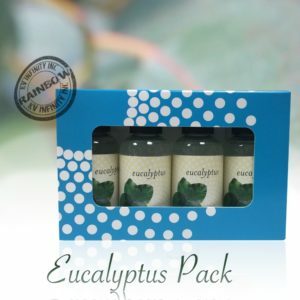 In addition to that, you can benefit even more if you add Eucalyptus or Eucalyptus with Menthol into the Water of the Rainbow or RainMate.Use it for sleeping, relaxing, when you have problems to breathe, in allergy season or just cleaning your home. Here you got 4 different presentations, sizes and concentration. You can choose the one that best suits your needs.